Emeritus Professor Edward W. Malan ’48, one of the most influential members in the history of the Pomona College Physical Education Department, died Sept. 6, 2011, at age 88. Malan came to Pomona as a student in the early 1940s and was already active in athletics, playing football and earning a letter as a running tackle, when, in May 1943, he was among a contingent of men who left campus for the U.S. Army. After serving with distinction in Europe, he returned to Pomona, graduating in 1948 and joining the faculty as an instructor two years later. He went on to earn a master’s at the Claremont Graduate School as well as an Ed.D. 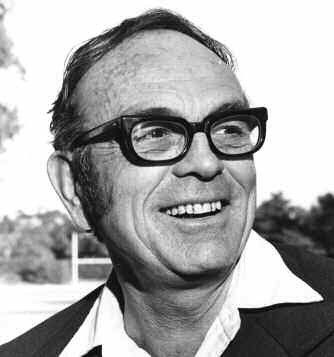 from UCLA, and in 1960 was promoted to professor of physical education and named director of athletics, a role he filled through 1978. During this time the challenging yet rewarding process of equalizing men’s and women’s athletics was begun, and the number of intercollegiate competitive sports rose from seven to 17. In addition to coaching several years of both varsity and frosh football (including an 8-0 season with the 1950 frosh football team in his first year), Professor Malan coached track and field until 1966 and golf later on in his career. He founded the department’s Athletic Hall of Fame in 1958, oversaw its induction ceremonies for 42 years and in 1989 was himself awarded an honorary induction. That same year, he also received the SCIAC Distinguished Service Award. Along with serving as the College’s NCAA representative, he was very active in the NCAA Council and was elected to the presidency for Division III. As a resident of Claremont, he was elected to the City Council twice, for the 1962-66 term and again for 1968-72, during which time he was mayor from 1970-72. He retired from Pomona in 1989 but remained active with the College and, in 2001, received its Alumni Distinguished Service Award.